Brad and I are preparing to hunt/film this afternoon. The wind is out of the south and the temperature is seasonal to a bit cold (as it has been for a few days). Yesterday Brad checked all of our Reconyx trail cameras and reviewed the images (8,000+). 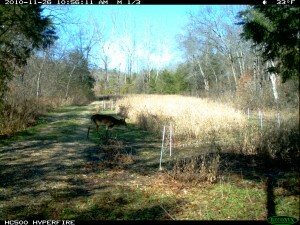 Does and fawns at The Proving Grounds are beginning to frequent food plots regularly. However, images of mature bucks indicated they are still looking for a date. There were no images of mature bucks (4.5 years old or older) that indicated they were on a food/cover pattern. Given this our strategy for the next few days is to hunt where we can see the maximum number of does/fawns and hope that one of them has a hit list buck trailing behind. We’ve purposely have not hunted food plots much at The Proving Ground this season. Deer were simply choosing acorns. That is great if you are hunting in areas where oaks are rare like ag areas. However, when oaks dominate the landscape and the preferred food is everywhere, a huge acorn crop is a detriment to hunters. Thankfully the acorns are about all consumed and the food plots at The Proving Grounds haven’t been hunted much so the deer should be comfortable feeding there during daylight hours. We’ll start confirming if this is a good strategy this afternoon. 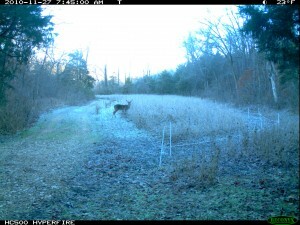 We’ll approach and leave the stands carefully as all the work of growing the crops, hanging stands, scouting, etc., can be spoiled by carelessly alerting mature deer to our presence. Hunting mature bucks successfully usually requires a much different strategy than those I used when I was younger and simply looking to harvest any buck.